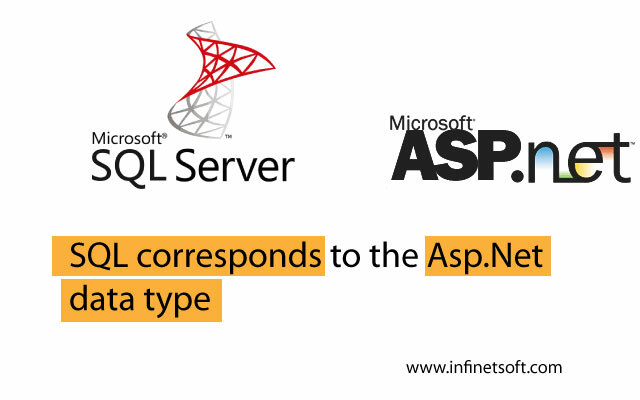 Sql corresponds to the Asp.Net data type, someone asked me to explain? During the development of the program, when creating SQL stored procedure parameters, you need to find the corresponding SQL data type according to the defined ASP.NET data type; if you are not familiar with the "Sql and Asp.Net data type", you will need it. Their correspondence tables are listed in detail below. Related note: BigInt is supported by the .NET Compact Framework; Int64 is a 64-bit signed integer; Binary is supported by the .NET Compact Framework; Array is a fixed-length stream of Byte binary data, ranging from 1 to 8,000 words Between sections; Bit is supported by the .NET Compact Framework. Supported by the .NET Compact Framework. -1.79E +308 to floating point numbers in the range 1.79E +308. A currency value ranging from -214,748.3648 to +214,748.3647 with an accuracy of ten thousandths of a unit of currency. A currency value ranging from -263 (ie -922,337,203,685,477.5808) to 2 63 -1 (ie +922,337,203,685,477.5807) with an accuracy of ten thousandths of a unit of currency. A fixed-length stream of binary data ranging from 1 to 8,000 bytes. An unsigned value that can be 0, 1, or a null reference (Nothing in Visual Basic). A fixed-length stream of non-Unicode characters ranging from 1 to 8,000 characters. Date and time data, with values ​​ranging from January 1, 1753 to December 31, 9999, with an accuracy of 3.33 milliseconds. Fixed precision and scale values ​​between -1038 -1 and 10 38 -1. A variable-length stream of binary data ranging from 0 to 231 -1 (or 2,147,483,647) bytes. A fixed-length stream of Unicode characters ranging from 1 to 4,000 characters. A variable-length stream of Unicode data with a maximum length of 230 - 1 (or 1,073,741,823) characters. A variable-length stream of Unicode characters ranging from 1 to 4,000 characters. Note: If the string is greater than 4,000 characters, the implicit conversion will fail. When using a string longer than 4,000 characters, explicitly set the object. -3.40E +38 to 3.40E +38 floating point number. Date and time data, with values ​​ranging from January 1, 1900 to June 6, 2079, with an accuracy of 1 minute. A variable-length stream of non-Unicode data with a maximum length of 231 -1 (or 2,147,483,647) characters. Automatically generated binary numbers and guaranteed to be unique in the database. Timestamp is often used as a mechanism to mark the version of each row in a table. The storage size is 8 bytes. Globally unique identifier (or GUID). A variable-length stream of binary data ranging from 1 to 8,000 bytes. Note: If the byte array is larger than 8,000 bytes, the implicit conversion will fail. When using a byte array larger than 8,000 bytes, explicitly set the object. A variable-length stream of non-Unicode characters ranging from 1 to 8,000 characters. Special data types, which can contain numeric, string, binary, or date data, as well as SQL Server values ​​Empty and Null, the latter two values ​​are used without declaring other types.